After I finished the disaster sweater that led to my becoming re-immersed in knitting last fall, and the dust had settled, and nobody was looking, I treated myself to a very small amount of qiviut and qiviut/merino blend from Cottage Craft Angora. The tiny skeins arrived very quickly and after ooohhing and aaaaahhing I squirreled them away, certain I would find some way to ruin them otherwise. 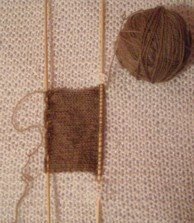 I got used to the smallish needles and tiny string in no time, especially given the melting softness of it between my fingers as the swatch got longer. And even though it did start some halo, which tells me I can knit on 3mm needles and still have a warm hat, it wasn't a bit difficult to rip it all out again and put it back on the ball once I'd measured for gauge. I don't have time to do anything with it now really, but man... if that's the blend, working with the pure qiviut will be inexpressibly delightful. You really have to be careful about working this stuff, Maire -- it's highly addictive, and can make other yarns seem very pedestrian and uninteresting. It's really the heroin of the yarn world.